On receipt of your application to join, you will receive a welcome pack comprising a welcome letter, a copy of the latest edition of Spot Press, a copy of the Club Constitution, a Gestation Chart & Year Planner, and a copy of our GOS Breed leaflet. If you join via the website you will be sent an email confirmation within 24hrs, remember to check your junk mail after this time. All members while exhibiting pigs at shows in the UK are automatically covered for Public Liability insurance up to the value of £2m*. Any member wishing to obtain a copy of the insurance document should send a cheque for £5 made payable to GOSPBC to cover admin costs, to the Secretary. Those applying for membership on or after 1st September enjoy up to two FREE months membership as renewal will not be due until 1st November the following year. You can now join or renew instantly using your credit or debit card via Paypal, a secure payment site. The Club encourages members (of all ages) to begin showing as a useful shop window both for the breed and their herd. For those pig-keeping members. One vote at General Meetings. Quarterly colour newsletter, Spot Press, featuring news, articles, advice etc. Also free classified advertising of pigs or relevant equipment or services. Championship rosettes are provided to smaller shows to encourage participation by breeders. Organisation of showing classes and card grading at the GOS Show & Sale. The Club advertises in various journals encouraging enquiries from potential purchasers. It also encourages media coverage to help to promote the breed. The Club publishes two leaflets (one about the breed; one covering Cyclic Breeding) available to breeders on request. Club officials will offer advice on GOS-related matters on request. The Forum on this website is established to provide free discussion and advertising. 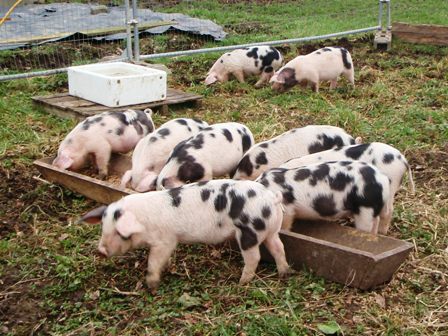 Free listing in ‘Our Members’ on this website (providing you have pedigree GOS pigs). Free listing in ‘Boars at Stud’ on this website. Discounted prices for Club merchandise. Use of the Members Only section on this website providing instant access to past copies of Spot Press, specific News for Members and special discounts on selected goods. Two adult members sharing the same address. Such members have two votes at General Meetings. For individuals without pigs who still wish to support the work of the Club. One vote at General Meetings. Individuals living overseas (including the Republic of Ireland). One vote at General Meetings. Discounted booking fees for participation in GOSPBC workshops. *Members must pay an excess of £500 on any claim.